Skincare products are truly effective only when they contain three specific types of ingredients. Your skin is hungry for these must-haves, and here’s what they are and why they are so important! What Are the Best Skincare Ingredients? We’ve been asked countless times which ingredients are the best for skin. People always want us to narrow it down to just a few ingredients, but it’s not that simple. We totally agree that such a list would make things a lot easier, but it won’t help you have the best skin of your life! Skin is the body’s largest organ. It also is complex and intricate, and so requires far more than one or two great ingredients to thrive and look younger. Think of it like your diet: Broccoli and green tea are healthy for everyone, but if those foods were all you consumed, you’d soon be unhealthy. Just like the body requires several types of foods and nutrients to maintain itself each day, so does our skin. What your skin needs to have in abundance, every day, are three categories of ingredients, regardless of your age or skin type. These categories are antioxidants, skin-replenishing ingredients, and skin-restoring ingredients. Each group includes dozens of amazing ingredients that can provide amazing benefits. Shopping for products that contain a range of these ingredients is the only useful approach to improving your skin’s appearance, and in ways your skin will love. Antioxidants are ingredients that intercept problems in the environment and then, through a complex process, stop, or at the very least lessen, their visible impact on skin. That means you’ll see fewer signs of aging and a more vibrant, healthier-looking skin tone! There’s no shortage of antioxidants available—most occur in fruits and vegetables, others are from vitamins or made in a lab (something we call “designer antioxidants”). Both natural and lab-made antioxidants benefit skin—and you cannot begin using antioxidants too soon. Going back to the food: Antioxidant-rich blueberries are good for you at age 20 and continue to be just as good for you as you move into your 40s, 50s, and beyond. Antioxidants work via different pathways and on different types of environmental threats to your skin, which is why we advise using products that contain a potent mix of antioxidants, not just one or two. Paula’s Choice Skincare includes complex blends of natural and lab-made antioxidants in many of our leave-on products, especially our serums and anti-aging boosters. For details on the numerous ways daily use of antioxidants can help skin and which ones we like best, see our article Top Five Reasons to Add Antioxidants to Your Skincare Routine. Skin-replenishing ingredients help fortify and revive skin’s surface, supplying long-lasting infusions of hydration. This stunning benefit helps skin look and feel soft, smooth, and supple. With ongoing use, skin-replenishing ingredients help skin resist moisture loss and maintain an enviably smooth, plump appearance, just like when we were younger. Skin-replenishing ingredients are found in all types of products, from facial cleansers to eye creams. Paula’s Choice Skincare includes a wide range of these ingredients in our products, especially in our toners and moisturizers. Skin-restoring ingredients have a special ability to care for skin’s surface in a way that helps transform it to appear noticeably younger. These ingredients can bring about a renewed feeling of firmness and, over time, a more even-looking complexion. Skin-restoring ingredients also help improve a dull skin tone and rough texture, and soften the appearance of fine lines and wrinkles—including deep wrinkles. They work beautifully with antioxidants and skin-replenishing ingredients to give aging, lackluster skin the total package of what it needs to look younger and more radiant on numerous levels. Well-researched examples of skin-restoring ingredients include anti-aging superstar retinol, niacinamide, peptides, linoleic and linolenic acids, epigallocatechin-3-gallate (found in green tea), and adenosine. 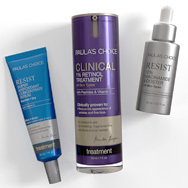 Paula’s Choice Skincare uses skin-restoring ingredients in many of our anti-aging formulas, including our retinol products and brightening products. If you keep antioxidants, skin-replenishing ingredients, and skin-restoring ingredients in mind as you shop for skincare products, you’ll be ahead of the game. These are the best ingredients for helping your skin look better in every way imaginable!